Here you will see my honest reviews and experience of 4 bath mats and bath rug (they are the best bath mats that I purchased and placed in my bathrooms). Why I have to investigate on these bath mats and bath rug? It’s not comfortable to step on wet tile or in a cold tub to take my bath, even the bathroom tub and floor are hazards for slipping and tripping, especially when it’s wet, I’m always worried someone in my family will fall and get hurt. Fortunately, I did research and found the solution was easy. My best bath mat solves all the worries I had about slips and falls, plus they keep bathroom germs away. My family can relax in the bath without any worrying or uncomfortable. This non-slip mat from EPICA is my top choice for safety. It sticks to the smooth floor of the bathtub with amazing tenacity. 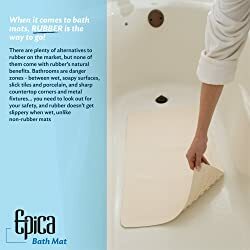 Good suction is essential in a bathtub mat, so EPICA definitely got five stars for that. Yes, I can sort of feel the little suction cups underneath, but not very much. The top texture is pleasant to stand on, and isn’t slippery underfoot either, even with body wash and conditioner streaming across it. It makes me feel safer knowing I won’t slip in the tub. As for good health, EPICA says that the mat is made from latex-free rubber. I appreciate this because I have a family member who suffers from a latex allergy. The mat causes no adverse reaction at all. So far, the mat hasn’t shown signs of mold or mildew, either. It’s easy to clean in the washing machine. That’s important to keep my family healthy. The rectangular mat is a good size for a bathtub. It doesn’t fill the entire length as it’s only 28 inches long, but that’s plenty for standing in the shower. I also purchased a second bath mat that is a little longer. That way taking a sit-down bath would be more comfortable in the tub. The Simple Deluxe mat is 39 inches long. At just over three feet, it covers a great deal of the bathtub so I don’t slip when I’m seated or standing during a bath. Feeling safe makes bathing that much more relaxing. Just like EPICA mat, the Simple Deluxe stays firmly stuck to the bottom of the tub. The top side has a texture that grips well even in soapy bath water. The mat drains well so it hasn’t developed problems with mildew or mold. I can toss it in the washing machine and keep it clean. One of the other big selling points for me is that the Simple Deluxe mat is made from BPA-free vinyl. If I take a hot bath, I don’t want to sit in a chemical soup. I don’t want the kids to be exposed to it either. How about you? I enjoy feeling safe in my bathtub with these two mats. But I also wanted something good to step out onto after a bath or shower. That’s when I found the Oceanstar Bamboo Mat. The Oceanstar Bamboo Floor and Shower Mat were exactly what I wanted for the bathroom floor right beside the bathtub. It made the bathroom look and feel like a spa. Plus, it keeps drips and spatters contained to one area. The nine non-skid feet on the bottom hold the mat firmly in place on the floor. It’s much safer and feels a lot better to step out on the wooden surface instead of wet tiles or a rug that slides. It also protects the floor because its open design allows moisture to evaporate from underneath the mat. 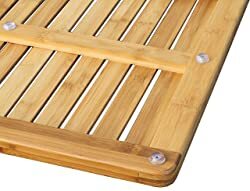 Bamboo is naturally anti-microbial, so it resists bacteria, mildew, and mold. A quick wipe with a cloth and the mat is ready for the next bath. Once a week I wipe it down with all-natural Murphy’s Oil wood soap. I love that it’s easy to clean like this I can use fewer harsh chemicals around the house. Last but not least, there is one more thing I added in my bathroom. I laid down a new plush bath rug. 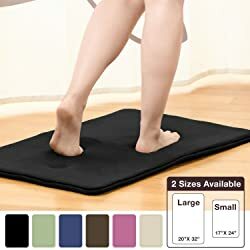 The Clara Clark Memory Foam Bath rug is delicious to stand on in the bathroom. When they describe it as “plush,” they really mean it. The ultra-soft microfiber and memory foam feel fabulous under my feet. I wanted to carpet the whole house with this. The underside of the mat has a non-slip surface so it stays put on the tiled floor. It doesn’t curl up or slide. This is important to me, especially in the bathroom. Although the top surface isn’t very absorbent, it isn’t exposed to a lot of water like the bamboo mat is. It’s machine washable and can be dried in the dryer on low. It still looks and feels like new after a few washing. Now you know all about my best bath mats, right? It’s funny how such small and simple things make such a positive difference in my comfort level day to day. Do you know what’s the mat you want to bring home? The mats and rug I bought for my bathrooms made my home a safer place. They are useful, comfortable, and have stood up well to wear. The time I spent researching was a good investment to get exactly what I wanted. These are the features and criteria I looked for when I researched mats, you can take it as your reference when you buy your bath mat. I’m sure you’ve heard that accidents happen the most at home. Slips and falls in the bathroom are very common. Bathtubs and tiled floors are slippery by design so they are easy to clean, and the danger level rises when they are wet. 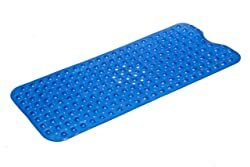 A bath mat with strong adhesion protects against falls in the tub. A bath rug with a non-skid bottom protects against slips and trips outside the bath. Bathrooms harbor a lot of germs and moisture. Rugs and mats that resist bacteria, mold, and mildew are essential. They also need to be easy to clean. I preferred bath mats made with non-allergenic and non-toxic chemicals so I’d never worry about exposing my family or a guest to something harmful. If the rugs and mats are hard to scrub or need special treatment to stay clean, they aren’t as likely to get the attention they need. When looking for mats and rugs, I preferred ones that were machine-washable and didn’t need special care or harsh cleansers. Promoting safety and good health is all well and good. But if a bath mat it isn’t comfortable, no one will use it. Daily use and regular washing will make low-quality mats fade and fall apart. I wanted well-made products that would endure so I would get the most bang for my buck. Bath mats are decorative as well as useful. I like the bright blue of the Simple Deluxe because it made my bath water seem more refreshing. The bamboo mat made the bathroom feel more luxurious. The rectangular shape of all my mats fits well with the architecture of the bathroom., while the black rug coordinated well with the colors of my fixtures. Since bath mats tend to be inexpensive, I didn’t worry about the price. Now it’s your turn to make your bathroom safer and more enjoyable with bath mats and rugs. It’s an easy and inexpensive upgrade. Thank you for reading this review. I hope this guide helped you select new bath mats and bath rugs for your home. Click here to see more products that will make your home safer and more enjoyable.